Diabetes is a biochemical disorder which affects the body's ability to use carbohydrates, sugars and starches. People with diabetes are not able to produce sufficient insulin or are unable to use the insulin they produce effectively enough to break down glucose or sugar in the blood and make it available to the body. More than 16 million Americans alone suffer from diabetes. Although South African statistics are not readily available, the incidence is known to be high and diabetes is often referred to as an epidemic in the Western World today. Type 1 Diabetes usually surfaces in childhood and is usually associated with the inability of the pancreas to produce insulin. People with Type 1 Diabetes are also called Insulin-Dependent because they have to take insulin for life. Type 2 Diabetes is also called Adult Onset Diabetes and usually occurs after the age of 40. People with Type 2 Diabetes do produce insulin in the pancreas, but their body cells have become resistant to it. Although people with controlled diabetes can lead a normal healthy life, uncontrolled diabetes means chronically elevated blood sugar levels which slowly destroy proteins in the body, causing considerable damage to tissues and organs. Complications from untreated or poorly controlled diabetes include kidney damage, heart disease, nerve damage, and even blindness. Diabetes must be diagnosed by a medical doctor, endocrinologist, homeopath or naturopath. However here are some of the more common symptoms. If you are at all concerned about whether you have diabetes, especially if you are overweight and have a family history of diabetes, please seek medical advice. Type 2 Diabetes, which begins in adulthood, is strongly linked to obesity and an unhealthy lifestyle. Both Type 1 and Type 2 Diabetes are known to have a strong genetic link. This means that if you have people in your family who have diabetes, then it is even more important to follow a healthy diet, exercise regularly and to take supplements and herbal remedies which can help to prevent diabetes. There is a great deal of evidence to suggest that the use of carefully chosen herbal remedies and dietary supplements can help to both prevent diabetes and to keep it under control in those who have already developed it. Along with the correct lifestyle changes, herbal remedies and dietary supplements can reduce or eliminate the need for prescription medication and can also aid in preventing some of the tissue and organ damage associated with uncontrolled blood sugar levels. 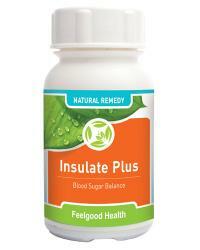 Insulate Plus is a complex herbal remedy in capsule form which can assist in the treatment and prevention of diabetes. Like all Feelgood Health products, Insulate Plus is developed with care by our practising Clinical Psychologist, is 100% natural and manufactured according to the highest pharmaceutical standards. Individual ingredients are well-researched and have been put to the test over the years as a complement to the treatment of real people with real problems. Yes, you can - but NOT without first consulting your doctor. These remedies are very effective in controlling blood sugar levels and improving the body's ability to use insulin. This means that blood sugar levels must be monitored in people who are also taking prescription diabetic medicine as it is highly likely that their prescription medication will have to be reduced or even stopped altogether. If your doctor is not familiar with natural remedies or is unsympathetic towards your quest for a healthier alternative, seek a second opinion. Absolutely! Many people with borderline diabetic symptoms or those at risk for diabetes will benefit from the regular use of these remedies. Remember that it is also important to make sure that you follow a healthy lifestyle in order to effectively control the risks of diabetes. Caution: Safety in pregnancy has not yet been established. Use only under medical supervision if you are also using insulin or other prescription diabetic medication. Because these herbs are very effective in controlling blood sugar levels, the dosage of your prescription drugs may need to be reduced or even stopped altogether. "I recently visited my doctor because I felt tired all the time. He said that I was at risk for diabetes due to my bad eating habits :-( My grandmother had diabetes so I know I have to be careful. I started taking Insulate Plus and my doctor can't believe the difference!" "I want to let you know that I have had problems for ages with my eyes and circulation because of diabetes. My homeopath recommended Vizu-All and after 10 weeks there is an enormous difference! I don't have blurred vision any more and all the tiredness is gone. Thank you Feelgood Health!" "Because of diabetes I had major problems with my feet and always felt tingling and discomfort. Sometimes I couldn't sleep because of it. Anytime I had a sore, it took ages to heal. Since using Insulate Plus this is a thing of the past and I don't think that I have ever slept so soundly! I have used many of the Feelgood Health products and have never been disappointed with their effectiveness as well as the fast and efficient service and friendly advice!" Gymnema sylvestre: A well-known and highly respected Ayurvedic remedy which is also known as the 'sugar killer' as it is said to remove the taste for sweet foods. Gymnema Sylvestre has been used in Ayurvedic medicine to treat diabetes for many centuries and can improve blood sugar control, thereby reducing the need for insulin and hypoglycaemic medication . Vaccinium myrtillus (Bilberry): Research has demonstrated that Bilberry can reduce blood sugar levels in Type 11 Diabetes and can also increase insulin production. Bilberry is a very powerful anti-oxidant due to high levels of anthocyanosides, which help to prevent cell damage caused by free radicals. Regular use of Bilberry helps to maintain healthy vision and is known to strengthen the tiny blood capillaries which carry oxygen to the eyes, It can also help with varicose veins and haemorrhoids. Dosage: 1-2 capsules, two to three times a day. Feelgood Health Tip: Circulation problems and slow healing as well as eye disorders are common in people with diabetes. We therefore strongly recommend our herbal Vizu-All Plus as an excellent companion remedy to Insulate Plus. (See our Combo Pack!) Our Triple Complex Diabetonic is also a great tissue salt remedy! As with all good tonics, Insulate Plus gets to work immediately and results may be noticed within 3-6 weeks, with some individuals responding sooner than others. Best results are achieved when Insulate Plus is used consistently and the recommendations regarding diet and consistent discipline are followed. One bottle of Insulate Plus at the recommended dosage (1-2 capsules two to three times daily) will last about 15-30 days. Exercise regularly. It has been shown that people who exercise regularly are 50% less likely to develop Type 2 Diabetes.